TOKYO--(BUSINESS WIRE)--Keio Plaza Hotel Tokyo (KPH), one of Japan’s most prestigious international hotels located in Shinjuku, Tokyo, will host an event entitled “Hina-matsuri through Tea Ceremony Culture and Hanging Art” to help guests celebrate Japan’s cultural event known as Girls’ Doll Festival or “Hina-matsuri” from February 1 (Friday) to March 28 (Thursday), 2019 with magnificent hanging art ornaments displayed in our lobby and special menu items served in our restaurants. In addition to the display of some 6,800 magnificent and ornate handmade dolls and other traditional decorations in this coming event, our Hotel will also display various traditional and historical art items used in traditional Japanese tea ceremony, which has long been a part of the cultural upbringing of Japanese women from the Meiji Period (1868 to 1912). 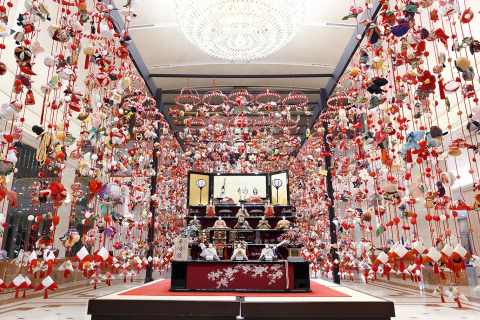 Some 6,800 magnificent and ornate dolls will be displayed to celebrate Japan’s cultural event known as Girls' Doll Festival from February 2019.